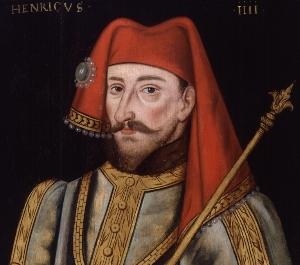 Henry IV has traditionally been one of the least well-known of England's kings, despite the fact that he had one of the most interesting lives and reigns. Ian Mortimer set out to fix this disconnect and bring Henry IV into the bright light of historical fame in The Fears of Henry IV, and he has succeeded brilliantly. Several times while reading this book I felt a strong urge to shake Mortimer's hand warmly, clap him on the shoulder, and buy him a pint of ale to thank him for the wonderful work he has produced which is, quite simply, everything a biography should be. What I love so much about this book, and about Mortimer's approach, is his focus on the human aspect of Henry IV. Biographies need the details of the subject's life, the political ramification of their actions, and surely (at least in late medieval history) religious beliefs and ideals. But there has been a trend in the past to ignore the personality of the subject, and any discussion of their emotions is usually avoided like the plague (which was mostly over in Europe by the time of Henry's birth). What Ian Mortimer has achieved is, in my mind, historical/biographical perfection: He analyzes Henry as a man, as a human, bringing him to life before our eyes and making him recognizable to us despite the centuries since his death. Mortimer's book is professional and intelligent, with all his interpretations based on and supported by strong evidence. To some historians it seems, the discussion of personality and humanity is anathema to good, factual history. And obviously the facts are the most important part, the framework to understanding what happened in the past. But the real question is why do we care? What makes history so magical that we lie awake at night thinking about it (I'm assuming this happens to everyone...)? Mortimer must have read my mind to answer this question: "History is the study of living men and women, not merely names in desiccated documents". 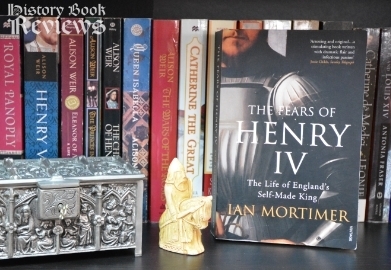 Their humanity and their connection with us today is the spark that drives me to learn more, and Mortimer has woven that living spark seamlessly into the historical facts and framework to create this biography of Henry IV. The Fears of Henry IV chronicles the life of Henry of Lancaster, or Henry Bolingbroke, uniquely dedicating almost as much time and study to Henry's early life as it does to his reign as king. Mortimer's writing style is passionate and immediate, making me able to envision every battle and joust, even making my heart beat a little faster when the Peasant's Revolt of 1381 happened, with all its bloodshed and destruction. The relationship between Henry and his cousin, King Richard II, is examined in detail, offering compelling insight into the power dynamics between them and why Henry seized the throne in 1399. Portrait of King Henry IV, painted close to 200 years after his death. Another reason I admire Ian Mortimer is that he is very fair in his assessment of his subject. He is obviously pro-Henry and wants to portray him positively in opposition to the view of him as a usurper. But that doesn't stop him from revealing Henry's weaknesses and failures, his contradictions and his mistakes. Rather than avoiding these things, Mortimer addresses them without trying to justify them, and offers explanations or ideas about how we might put them into context, and this creates a much more complete and believable picture of Henry. He strikes an ideal balance, avoiding the pitfalls of labelling historic figures as wholly good and innocent or wholly bad and manipulative (do I even need to mention Richard III, who currently has both of these labels simultaneously?). This book is aptly titled The Fears of Henry IV, because in many ways his reign, and his life, were constantly in danger. At least eight assassination plots were uncovered against him, some of them stranger than others. One of the schemes that left me wondering was an attempt to smear a poisonous ointment on the saddle of Henry's horse that would make him swell up and die before he had ridden ten miles. So, wait...would this have worked through his clothes, or were the plotters assuming he would ride naked? If it could go through his clothes, wouldn't it also eat through the leather of the saddle and kill the horse? Either way, you have to give the plotters credit for their creativity. Henry's reign was not accepted by the ruling family in France, and this tension led to Henry being challenged to a duel in a letter from Louis, Duke of Orleans (the French King's brother). They argued back and forth over several letters that survive, which are uniquely personal and emotional for correspondence from this time. Both men had their honor at stake, so I tried very hard not to find their letters hilarious. Louis basically said (and I'm paraphrasing a lot): "You acted like you didn't know my letter was for you just because I didn't include 'King' in your title, but your name was still on the front of it, you stupid idiot!" As I said, paraphrasing. The only thing I was disappointed with in this book was the slight discounting of Henry's family and the influence they had over him (he mentions Henry's son being shot with an arrow in the eye and not likely to live, but then never mentions it again and reintroduces the son later as if nothing had happened), as well as the lack of speculation as to what disease Henry suffered from. You can't just throw in the fact that his lower body was rotting away beneath him and not try to figure out what was causing it! However, these were minor things compared with the overall quality of the book. As Mortimer reminds us, Henry IV was called "Savior" at the time of his accession, not "Usurper", which is how he is commonly known today. The Fears of Henry IV is more than just a rehabilitation of the man, it is a unique and special work that examines all aspects of Henry's life and character, and one that leaves the reader with an understanding of the changing social order of the late Middle Ages and Henry's role in changing it. My hat goes off to Ian Mortimer for his accomplishment in this book. It truly is one of the best historical biographies I have ever read.